One of my objectives in recent months has been to be more conscious about choosing to read when I have downtime. Even for someone who loves to read (and who—gulp—speaks often about the physical and emotional benefits of reading), I can disappear down the internet rabbit hole all too often. Only to realize my one-hour break has vanished in a puff of YouTube videos, Instagram stories, and Twitter updates. It’s annoying. Especially because I well know that I’m a happier human—to say nothing of a sharper writer and thinker—when I make time for books. They don’t have to be great books (though I do enjoy great books). It’s the getting-lost-in-another-world part that is so transformative for me. So sometimes around late November, I pledged to start following my own advice and read, read, read. Every available moment. This led to a monster month of reading in December. I doubt I’ll read 19 books in a single month again until I have another vacation. Nevertheless, as far as making time for reading, I’ve started January strong with seven books read. I cannot resist novels in which ancient Greek mythology figures. This one is a YA novel about Helen, the 14-year-old daughter of Zeus and a mortal woman who moves to London to live with her father. I enjoyed the way ancient Greek mythology was not the centerpiece but another facet of Helen’s identity, another challenge in a life filled with them. Helen deals with grief, fitting in, first romance—themes that resonate no matter how much you do or don’t know or like about Greek mythology. It's a clever, heartening book, especially for its intended age group. I also cannot resist a novel that plays with time, as you may know. This one takes a unique—and mind-bending—approach to the concept. Aiden Bishop is trapped in a time loop, compelled to relive the same day over and over until he solves the murder of Evelyn Hardcastle. The catch is that he wakes up in a different body (none of them his own) for eight days. If he does not solve the murder in that time, his memories are wiped, and the loop begins again. The narrative moves backwards and forward across the eight days, into and out of different bodies. I lost count of the twists and turns and immediately felt I needed to start it all over again upon finishing the last page, hoping to figure out what the heck I just experienced. It’s not a novel to read if you like a tidy narrative that you can follow from beginning to end. But if you don’t need that, this one is quite a ride. Against the backdrop of political turmoil in 1980s Nigeria, this novel follows Akin and Yejide, who fall in love and marry while Yejide is a university student. Four years into their marriage, they have not produced children, and Akin's family decides he must take on a second wife, despite his and Yejide's objections. What unfolds is a story of loss, secrets, and heartbreaking decisions. The novel asks how much we know about the people we share our lives with and how much we hide from ourselves. I can’t very well read all (or a large number of) the English translations of The Odyssey without context. I highly recommend this for Homer enthusiasts or early classics students. It’s a readable and informative overview. These are two shorter works by Tacitus. “Agricola” is a tribute to his respected and admired father-in-law (the eponymous Agricola) and “Germanica” an ethnography and discussion of Germani tribes. Essentially, they meditate on empire and its consequences, themes central to Tacitus' longer works as well. If you've not yet read Tacitus but are interested to, this is not a bad place to start. I was surprised by how much I enjoyed this collection of middle grade and YA short stories around the themes of winter and magic. Truth be told, I don’t often read short story collections. I can find it jarring to be pulled in and out of different worlds every 20 or so pages. Somehow, this collection rather enchanted me, perhaps because of the fantasy elements. The stories are all quite different, with varying degrees of magical realism. One I enjoyed in particular was set in Saint Petersburg (Russia, not Florida) and recreated the first-ever production of The Nutcracker. 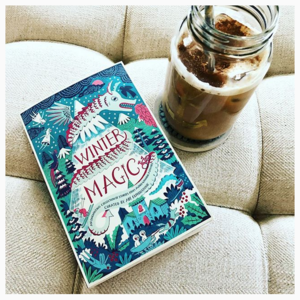 I was so sad when Winter Magic ended that I decided to dive into Snowglobe, another middle-grade fantasy. It follows Clementine (called Clem for short) and Dylan. At school, Dylan stands back and watches as Clem is cruelly bullied, but when she discovers he has been trapped in a snowglobe, she resolves to free him. In the process (by which I mean much danger and adventure), she discovers a treasure that was taken from her. I liked the mood of this very much! What books have you been reading so far this year, and what books are you most looking forward to reading in 2018?